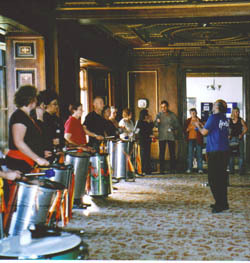 One Voice Music was invited by Emma More, leader of RAW Samba, to present a residential course (held in partnership with the Isle of Wight Council Arts Unit) to percussionists from RAW SAMBA along with FaT Samba, Unidos and Greenmount Samba bands. The 40 strong group was of a mixed level, and we identified one or two stronger players in each section to support the others. We primarily studied Raz Jayasuriya’s own grooves, which combined elements from Brazilian & Cuban rhythms. The material consisted of call and response intros, breaks, solo sections, phrasing for particular Surdos, Timbas, Reps and Tamborims. A piece in 6/8 was also presented and, as this was a time signature new to many in the group, we did some clapping exercises to explore working with 6 beat cycles first. 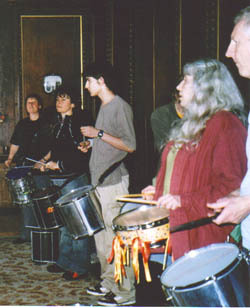 A common problem with these intense workshops is that some people aren’t used to drumming for long periods. The workshop was therefore paced to provide participants with enough short breaks and encouragement to keep everyone focused, and play with precision and positive energy – without tension. The aim was to help people build their stamina so that the grooves didn’t slow down or suffer in any way when played over a long period. After only 13 hours of study the group were able to play three grooves with fairly complex arrangements, using a lot of concentration and plenty of ‘swing’. “Thank you for making it such a fun weekend. All of the feedback has been very positive; everyone was amazed at the amount they learned and not just the rhythms! Raz managed to reach all of the levels within the group. The band leaders have all said how much they learned and are now going to put into practice. 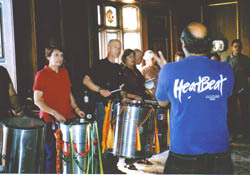 Looking forward to more samba workshops on this sunny island.” Emma More, Musical Director, Raw Samba. “I thoroughly enjoyed the weekend and learnt new rhythms, sounds and techniques. I enjoyed the concentrated learning experience and would have liked longer.” Paula New. “The 6/8 piece was magic…A great tutor and a magic weekend.” Dave Cotton.